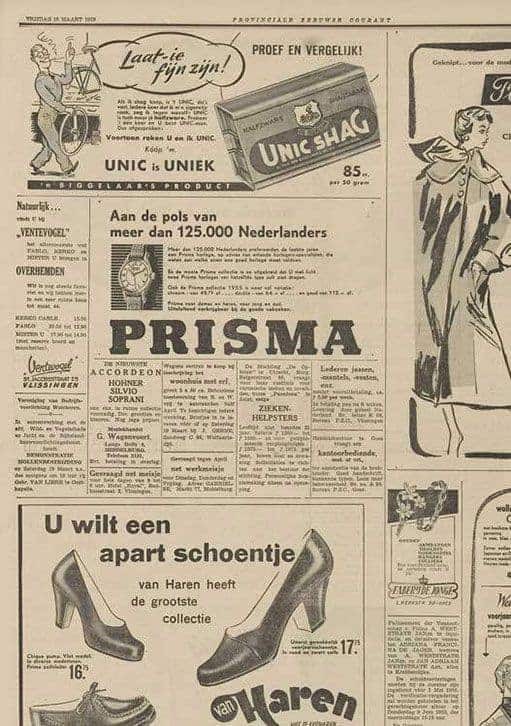 Welcome in the magical world of Prisma, the oldest Dutch watch brand. An invitation to creativity and craftsmanship. Do you remember when you got your first Prisma watch? Many Dutch people still do remember that moment. Already in the year 1955 we had a major milestone. Over 125,000 people wore the Prisma watch on the wrist. There is even an advertisement about this in an old newspaper. 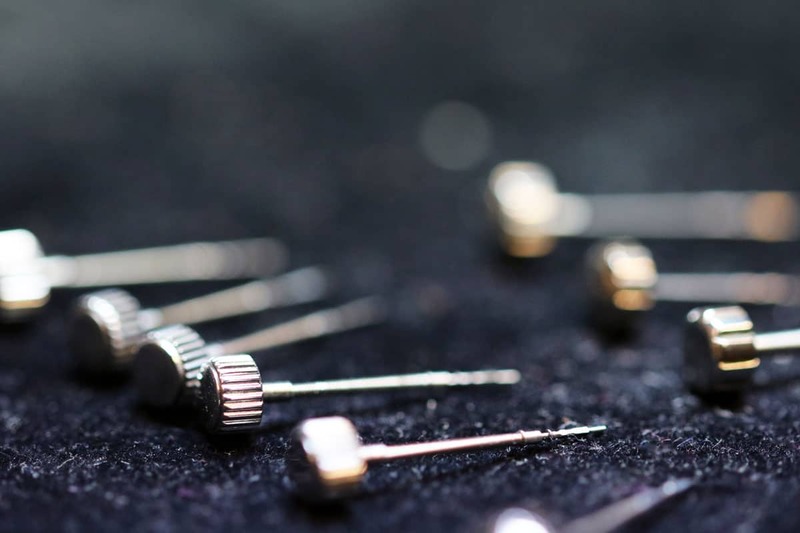 On this page you will discover more about the Prisma history, the future, the assortment, the Prisma jewellers and the community. Dutch watch brand Prisma stems from a collaboration of watchmakers. They wanted to introduce a new watch line that was accessible to everyone. For people who appreciate style and quality, but who do not need a watch of thousands of euros. This dream came true after the war in the year 1948. The first Prisma watch was made to offer high quality, elegant watches for a good price. 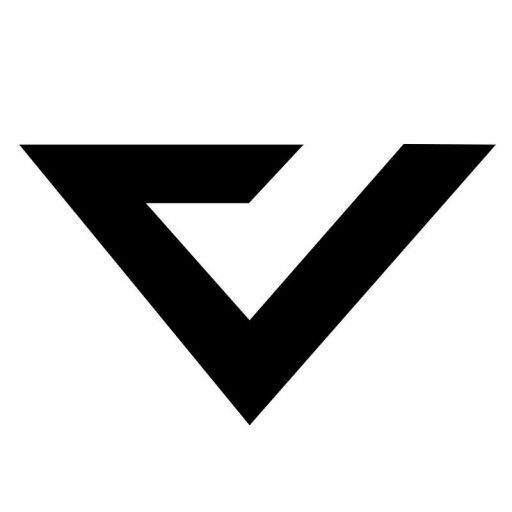 Since the creation of the brand almost 70 years ago, these are the fundamental core values. Our passion is deeply rooted in Dutch culture. Simple, honest and reliable. 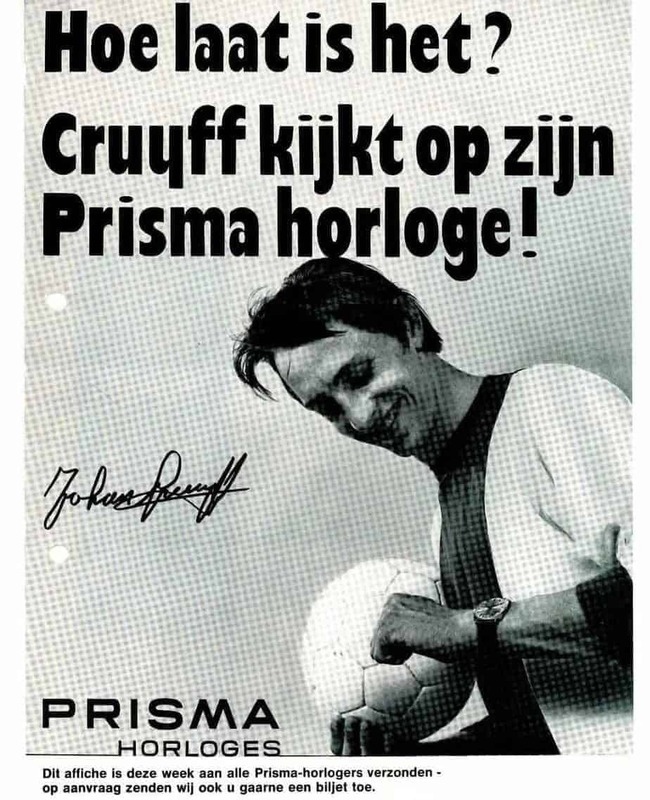 This gave Prisma a place in the heart of many people, including Dutch celebrities such as Johan Cruijff and Irene Moors. Prisma is named after the shape of a cut diamond. The diverse light that falls through a stunning diamond represents the variety of the brand. Every person has his own abilities and dreams. A watch is therefore one of the most determining accessory to show the world a little more about you. Another nice fact is that Prisma was one of the world’s first watch brands with quartz movements in the mid-20th century. This innovation made watches more accurate and less expensive. We think that is pretty cool. In addition, Prisma continued to produce mechanical and gold watches. Those were favourite to give as a present. For example, if someone worked at the same company for 25 years he or she would receive a golden Prisma watch. Over the years, Prisma has become a well-known watch brand in the Netherlands and abroad. The collections went along with their time without losing sight of the good old past. With Prisma you are assured of quality. Prisma is The Netherlands and The Netherlands is Prisma. 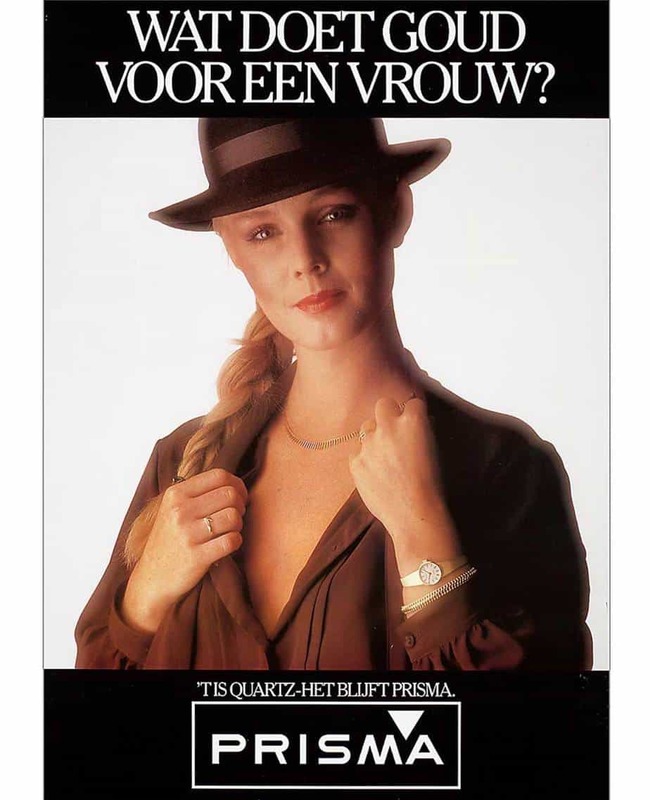 As diverse as the Dutch population, so varied is the offer in Prisma watches. From reliable work watches to design watches. A beautiful watch is a wonderful expression of character. It does not matter what you do in everyday life. This Dutch watch brand has the right watch for you. We like to see everyone happy with his or her appearance. Prisma proudly shares this open Dutch feeling. The collections reinforce this lifestyle. Wrist watches were first worn by military men towards the end of the nineteenth century. It was clear that using pocket watches while in the heat of battle was impractical, so officers began to strap the watches to their wrist. Unfortunately high quality watches, which were resilient against the elements of nature, were very rare then. Watches of that time could not withstand heavy impacts, so the quality of used materials was improved in subsequent years. Inspired by this development and circumstances, the first Prisma watch was produced in 1948 from the desire to deliver a quality timepiece which could stand the age of time. 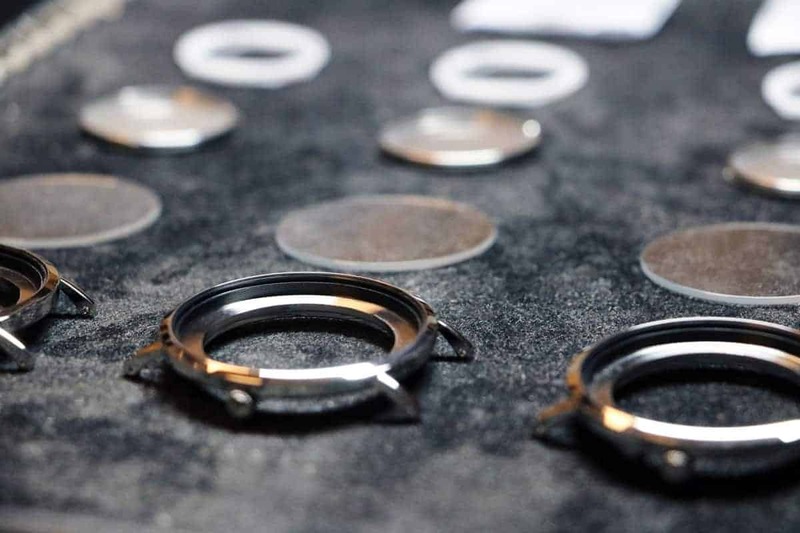 All Prisma watches are made from all stainless steel or titanium. A selection of these quality watches also have (scratch proof) sapphire glass. We aim to make people happy with the same watch for a long time. Watches with 10 or even 20 ATM waterproofing are no exception. The leather straps are hypoallergenic and made of top quality. So with a Prisma timepiece you really have quality on your wrist. Watches really get their value over the years. Therefore only the highest quality materials are used. And everyday we are looking for ways to improve this quality. Quality watches have a quality movement. 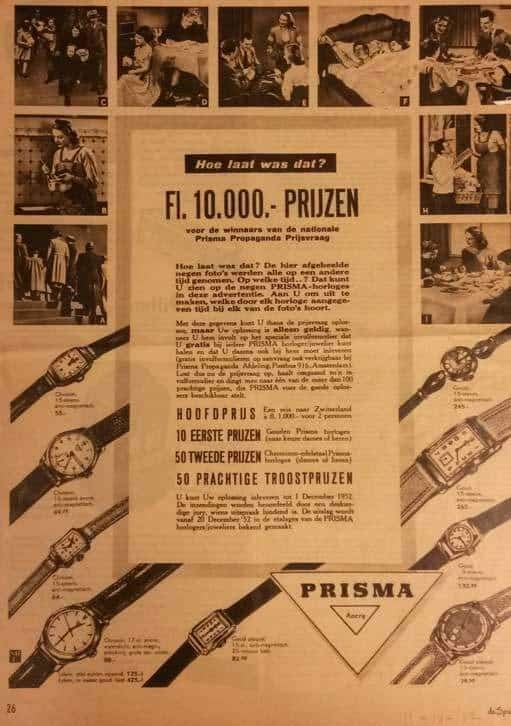 Prisma was one of the world’s first watch brands with quartz movements in the mid-20th century. 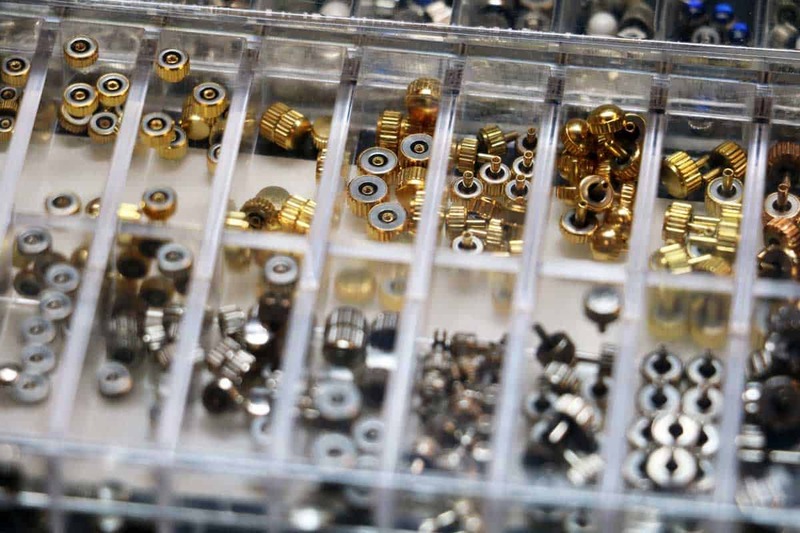 A major advantage of the quartz movement is that there are less moving parts required. This innovation made Prisma watches more accurate and less expensive. 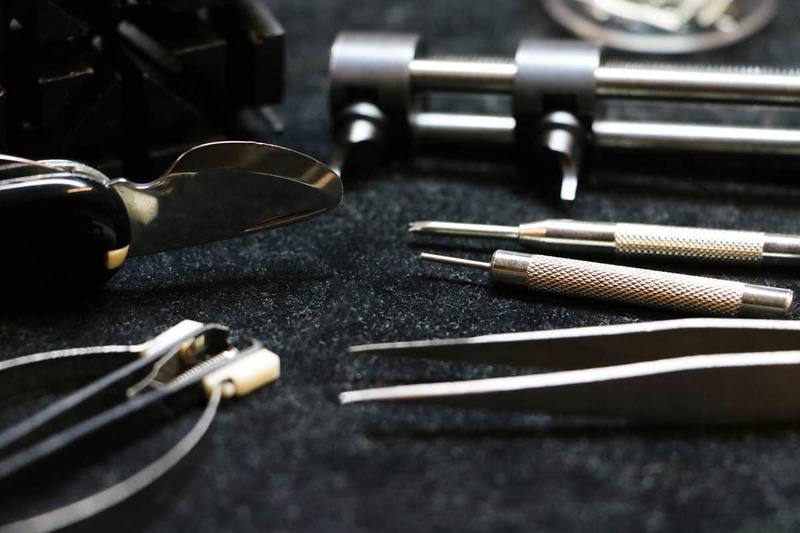 Of course there are different brands and types of quartz movements. Prisma is using Ronda (Swiss), Miyota and Seiko (Japanese). 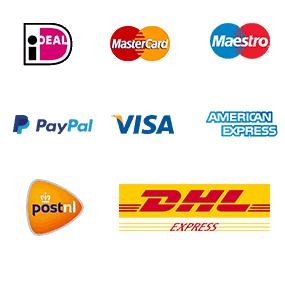 These are well-known for their durability and value for money. Which is in line with Prisma’s mission to offer reliable timepieces for everyday use. To make sure you will get a quality watch, all Prisma watches purchased come with a two-year warranty from the original date of purchase. Made to last. Almost nothing is so damaging to your watch as water. So waterproofing is inextricably linked to a quality watch. That is why all Prisma watches are water resistant. Of course there are many different grades in watertight. Some watches only make contact with water during hand wash or a rain shower, so 3 ATM is sufficient. 5 ATM water resistant is also working fine for taking showers, although we never recommend to make contact with water when you are wearing a leather strap. A step up is 10 ATM water resistant, which you can swim with. Prisma also provides watches with 20 ATM and even a deep diving watch with 100 ATM (1000 meter of pressure). All Prisma watches have been tested for water tightness in a laberatorium. Thanks to this unstoppable urge to always seek for the best, Prisma has become a well-known watch brand in The Netherlands and abroard. Is quality all you expect in a watch? Not a chance. Your watch is a statement. Probably the most determining accessory there is. That is why we love watches so much. A Prisma gives a little insight into who you are. It represents your lifestyle. This Dutch watch brand is comfortable and stylish. Modern and with a classic touch. Other watches are cool and sporty, because it just feels good to be sporty. It activates a positive attitude to life. That is why Dutch watch brand Prisma is also offering trendy models for every occasion. Complete your look with one of these eye-catching timepieces. Many people love the timepieces for their versatile designs. It is therefore not surprising that Prisma is working with around 35 designers to create good-looking watches for you. Every little detail in the design gets attention. For example, just for the dial there are hundreds of possibilities. Think of the index (dashes, dots, numbers), the hands, material, glass shape and colour. All affect the overall appearance. That is why a stunning watch is the perfect way to show your unique traits to the world. Furthermore is also considered how the watch feels, as we understand that you need to find enjoyment in wearing your watch. We want everyone to be happy with their appearance. Whether you are looking for something classic, elegant or sportive. Prisma offers you the appealing accessory. Experiment which watch flatter your figure and express your unique personality. Unlike other items that people traditionally buy to express themselves, a watch is on constant display. 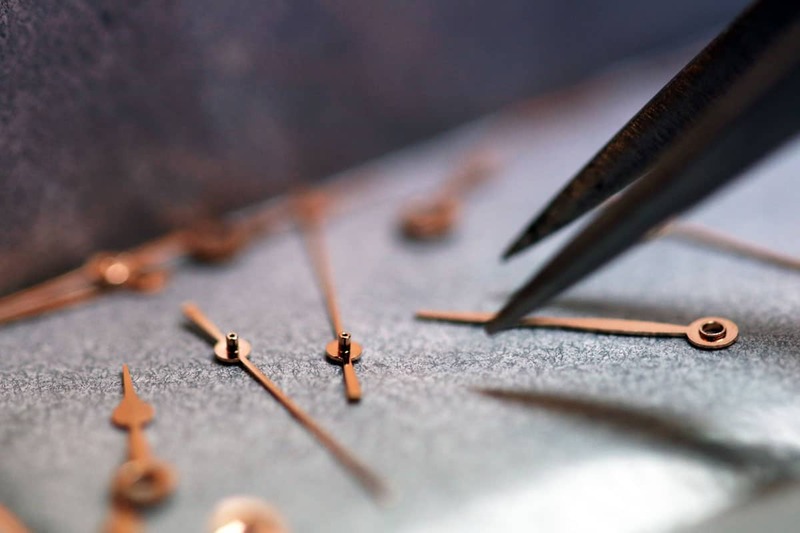 That is the reason why we make extra effort to create stunning watches. Affordable watches absolutely don’t undermine great style. Dutch watch brand Prisma believes it is all about the appearance instead of the price. Just make sure you have payed attention to the look, color and material of the timepiece. The options are endless. After all, great style is style that is truly your own. We rather invest money in a fantastic product and great customer support, than spending it on unnecessary overheads and big marketing campagnes. A great product speaks for itself. Furthermore, style is much more interesting than fashion. A watch which is only wearable for a season, isn’t affordable. So our goal is to create affordable watches with timeless design. Skip the fast lane in the fashion world and look for products that match your personality. The premise is that very cheap watches inferior quality and expensive watches aren’t fair to the customer. Materials, product development and good employees form the largest area of Prisma’s expenditure. An other part of the budget goes to the local retailer. It is important that you can speak to an expert on watches and can go to that person for assistance. 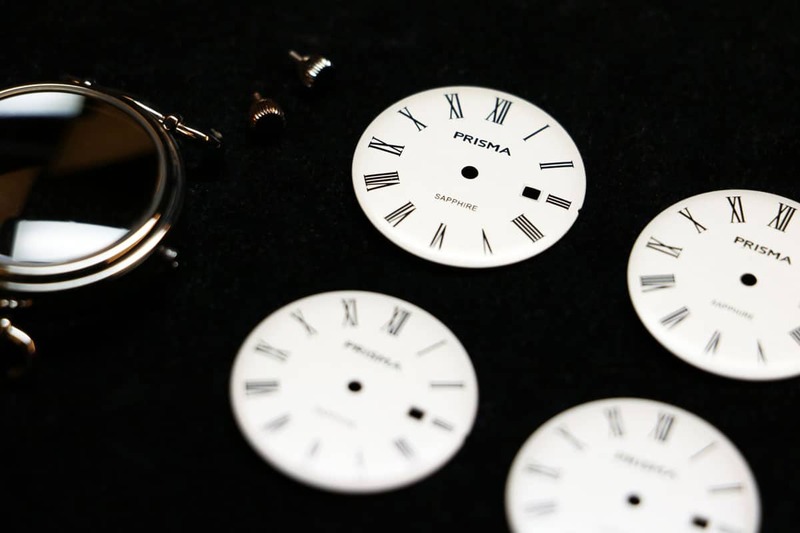 Despite these fundamental expenses, Prisma offers affordable watches.